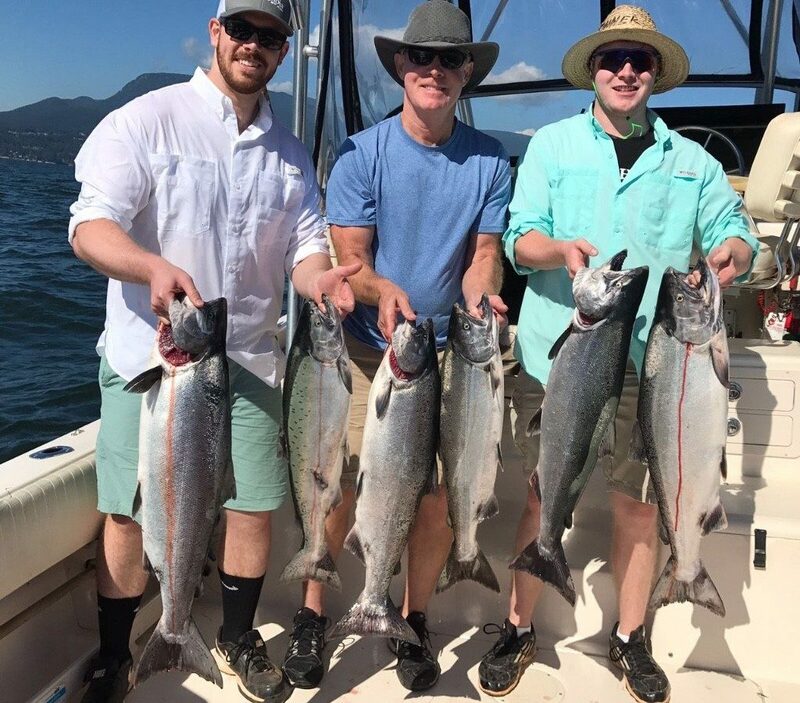 Jason’s guests from Arizona were all smiles yesterday after catching a limit of chinook salmon off the South Arm. The big story this week is the chinook fishing. A nice wave of chinook showed up on Monday and there was some hot fishing from the North Arm all the way down to the South Arm. It slowed down a little mid week as the orcas came in, but that didn’t last long and fishing was solid on Friday, including a limit for me on my full day trip and Tom getting into some good numbers off the North Arm on his afternoon trip. The best depths have been 30-80 on the downriggers and as usual, bait is the key. Make sure to bring a pack of herring and anchovies on each trip as we went through 24 baits pretty easily on Thursday. There are lots of jacks around, a few coho and pinks, and few dogfish, so make sure you have the bait and leaders ready for the action. The fish we are catching have been 10-20 pounds for the most part and there are few in the low 20’s as well. Hot flashers have been the Madi, Lemon Lime, Salty Dawg, Green Onion Glow, and Onion Purple Glow. For teaser heads the glow ones seem to be hot. Green glow and chartreuse glow varieties have been good. We have been dying up our baits in the Pro Cure Brine N Bite Complete in chartreuse and blue and it seems to be working extremely well. It definitely helps the bait stand out in the dirty water and the bites have all been savage. Not much too report off West Van. The coho fishing and pink fishing has been so so for the most part and we have been going over to the Bell Buoy or North Arm the last few trips to look for chinook. This weekend is the Vancouver Chinook Classic, which sold out! So if you want to get into this amazing event next year, make sure you sign up early. I will be ripping around in the big grey zodiac for this event, as Derby Master, so see you out there.